and hundreds of recommendations from our happy customers we can guarantee you will not be left disappointed! All it takes, is just to give us a call or request a free quote! We NEVER hire other shipping or removal companies! 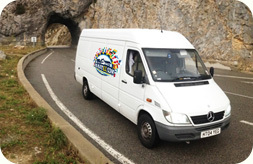 Every removals service we provide first-hand! including those moving to Europe or moving from Europe back to UK. company that have been in the international removals business since 2005 and in that time have built a reputation as efficient, professional, fast and careful movers. We have a highly trained, skilled and experienced team, new and modern vehicles, latest GPS equipment and knowledge of all custom regulations, so we never get stranded! We also can provide packaging and short term storage services. On your request, we can supply packing materials, such as bubble wrap, cardboard boxes, and various covers for your international delivery. Also we can provide storage facility to store your belongings at competitive rates. service that ideally suits your needs and budget. At your request online, one of our surveyors will call and discuss your planned move. You will have designated coordinator which will manage your international delivery from start to finish. Removals EU will provide you with the customs forms and insurance cover up to £20 000 or more. Our professional and experienced international removals team will take off the stress of your house or office international shipping, through personal attention and care.